At the first listening this highy adventurous album actually annoyed me in many ways, but I had an optimistic thought that it's simply one of those albums that need to be digested several times to "get" them. When I gave a praising five-star review for universal Totem Orchestra last week, I thought I may find more positive reception for this one too. And then I understood what's wrong with it. The music may be very clever indeed, but... it doesn't SOUND good to me. 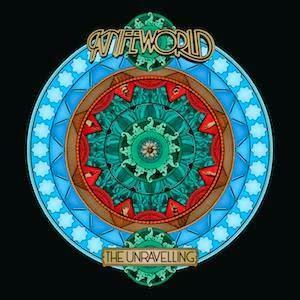 This is the second album - of three this far - by the British act Knifeworld, whose leader Kavus Torabi has Iranian family background. He's written all the music and he sings and plays various instruments, mainly guitar. I think he's a terribly bad singer. Stuffy voice a bit similar to Steve Jolliffe's (on Tangerine Dream's Cyclone, 1978) but lacking the peculiar charm. The line-up features women with nice vocals, so it goes beyond my comprehension why Torabi chooses to sing most of the album's vocals himself. And sadly the sound in general is quite stuffy, unclear. The first reviewer put it perfectly: "In reality, much of this album is a pretentious mess. Melodies and instruments clash and play past each other." There are many promising things. The arrangement varies nicely during the album (if the bad production hadn't blurred it all, that is), featuring seldom heard instruments such as bassoon, clarinet and violin. Saxes are used a lot. The main vocals on the opening track are by Melanie Woods and it's a pretty good composition, if rather restless. The edgy, eclectic coplexity and the use of male/female vocals remind me of the Finnish band DISCORDIA. But then it's steep downhill with the dominance of Torabi's vocals and the messy soundscape. I'm not saying there wasn't well thought precision in the sharp-twisting edginess, comparable to Frank Zappa or Gentle Giant. Maybe without those bad male vocals and with a more clear production this album would be a charming infant terrible. In fact I appreciate the adventurous spirit, the sort of "we do what we will, like it or not" attitude. Though most of the tracks concentrate on the restless complexity with not much of an emotional aspect, there are also some more delicate moments. 'This Empty Room Was Once Alive' is very ripped-down sonically: a sparse soundscape with a toy piano amidst other minimastically played instruments, and vocals are shared by Torabi and Melanie Woods. Damn. So close to being a disarmingly personal eclectic prog album full of surprises. The fact remains that the lion's share sounds stuffy and messy. With some pity, I return this CD to the library and say adieu, probably we won't be seeing anymore.